Ever have one of those crafts that, as you saw the pattern, you were immediately inspired to make it for someone because it's perfect for him? And in your excitement, you tell said friend in front of other related friends about your plans to make the craft as a Christmas gift. Then once you begin the project, you run into some snags. Ravelry commenters say the pattern has some sizing flaws, your yarn size isn't perfectly matched, and your knitting gauge has always been fairly wonky compared to standard instructions. But it's ok, right? You can do this. Crocheter for 3 years, knitter for 2, and comfortable with a certain degree of improvisation. So you measure your wonky gauge using the wrong sized yarn and compensate the best you can. 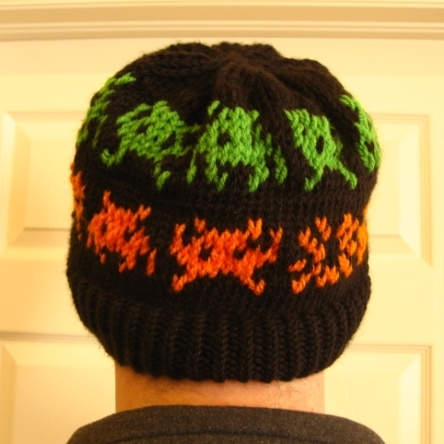 But by the time you are 80% done with making the seemingly awesome Space Invaders hat, you realize that it looks more like a head accessory for a Conehead than a human. You've gone too far to undo the whole thing (or rather, are unwilling to give up all that work), so in a last ditch effort, you attempt to decrease the diameter of the hat in half the number of rows, creating some kind of wrinkly, stumpy crown. Great. Have you ever been so embarrassed of a finished project that you didn't want to give it to the intended receiver? Did you end up giving it anyway? This has happened to me once or twice....every time I get it into my head to crochet somebody something. I think your hat looks fine and very awesome but I understand that we are our own worst critics. For what's it worth; you are far too hard on yourself. Great work!